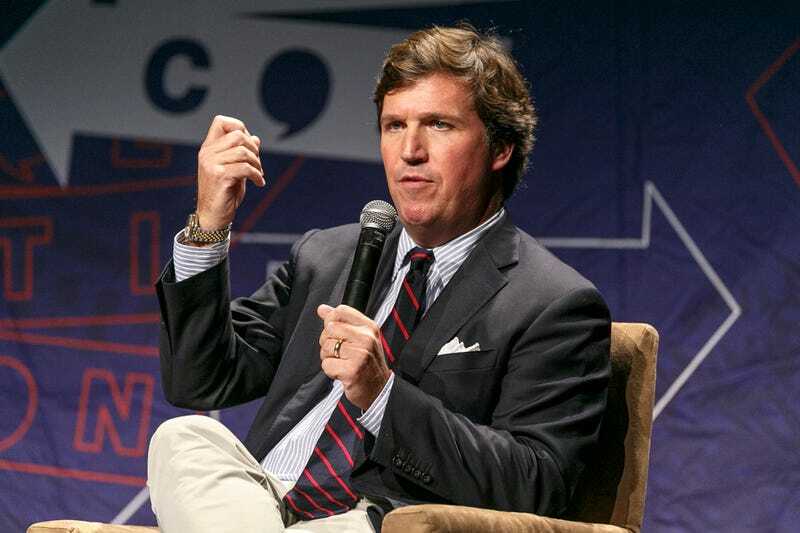 Turns out Fox News host Tucker Carlson doesn’t live under a rock near a swamp like many of us believed. He actually has a home in a really rich white area of Washington D.C.
Well, protesters found this out and surrounded the president’s second favorite barnacle (the first is clearly Sean Hannity) and began chanting and ordering the Fox News host to leave town. According to People, a group called Smash Racism DC can be seen in a video shared on Twitter. (The Root won’t be sharing the video.) In it, the group can be seen on Tucker Carlson Tonight host’s residence, holding signs and yelling “Tucker Carlson we are outside your home to protest fascism and racism” through a megaphone. Look, we at The Root hate Tucker Carlson as much as the next anti-Trump fan, but finding someone’s home and harassing them at their house is way out of bounds, even for us. At one point, the protester can be heard stating: “You promote hate and an ideology that has led to thousands of people dying by the hands of the police to trans women being murdered in the streets,” People reports. Carlson is going to eat this up. This level of harassment is going to lead Fox News. The fake journalists on Fox News live for this level of petty. Carlson hasn’t addressed the protest (yet), and People notes that Fox didn’t immediately respond to their request for comment. This doesn’t make Carlson a sympathetic figure, as he’s still trash. It was Carlson who claimed Planned Parenthood is the country’s leading cause of death. But it’s time for protesters to go back to a more respectable level of harassment, like following Congress members into public places, like, say, a restaurant and chastising them until they are forced to leave. Fine. That isn’t acceptable either. The same group, Smash Racism DC, also ran “Texas Senator Ted Cruz out of a restaurant in DC chanting ‘We believe survivors’ in reference to the sexual misconduct allegations made against Supreme Court Justice Brett Kavanaugh,” People reports.